Let’s assume you are an American blogger. Then you might be quite likely to write about love, or knitting. Or Google. At least these are some of the answers the Media Cloud project gives to a well-known question: what do American bloggers write about? By means of quantitative text analysis, the study gives a good overview of the hot topics in the nation’s blogosphere. 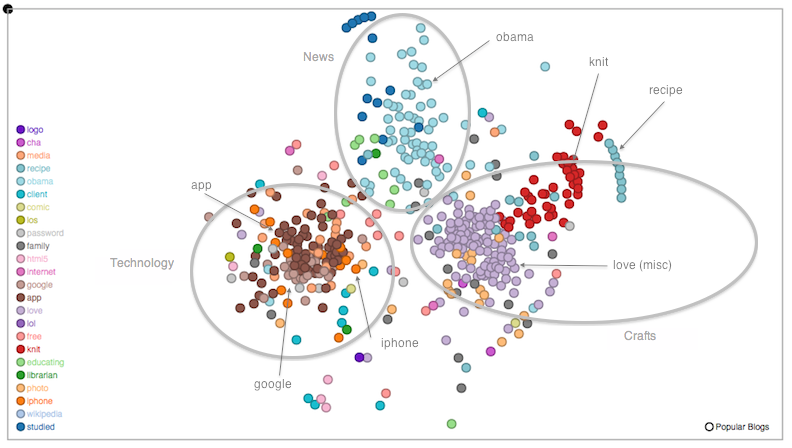 The Media Cloud researchers identify three big meta-clusters: crafts, news and technology. The blogs are linked together by a comparison of the similarity of their 100 most common words, taken over a time span of five months early this year. Below the meta level, a range of clusters emerge, which are titled after the most common word. And the biggest cluster is, indeed, “love”. The “love” cluster, part of the crafts umbrella, encompasses a range of general crafting and personal life blogs. Terms such as “family” and “children” feature here just as prominently as “cake” and “quilt”. Other clusters are more concise, such as “knit”. Still, some blogs may be wrongly grouped, such as that of the radio show “This American Life”, which is listed in the “recipe” cluster – perhaps because of a post on the original cola recipe. In the news meta-cluster, everything turns around the president – at least when it comes to key words. “Obama” is the biggest cluster in this area. A closer look reveals that this cluster encompasses what has been in the focus of political reporting during the last half a year, while the study was conducted. “Economy” and “crisis” are listed there, and so are “japan”, “egypt”, or “libya”. However, the study’s map does not seem to reveal a partisan split. Do bloggers on different edges of thee political spectrum essentially talk about the same issuees? Finally, a third meta-cluster encompasses what is hot in technology at the moment. And that seem to be Google, apps, and the iPhone. Interestingly, the study discerns the more software-focused “apps” cluster from the more gadget-y “iPhone” cluster. Are there two different conversations taking place? There is much more to discover still in the full results of the clustering run. Some other clusters comprise comic blogs or those centered around family issues. But do you feel represented by this clustering? In the comments on the Media Cloud blog, readers have already started asking for their niche, such as health or parenting blogs. Are you already on the map?